Mitsubishi Electric's Ultra-easy HMI prototype is a predictive agent that anticipates driver choices for onboard electronics such as navigation systems, displaying menu choices on a HUD. At an R&D open house in Tokyo on Thursday, the electronics maker showed off a prototype of what it calls the Ultra-simple HMI, or human-machine interface. 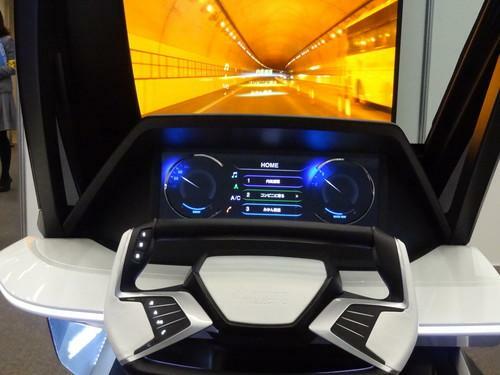 It's a mockup of a driver's seat, steering wheel, and a HUD (heads-up-display) projected onto a windshield that presents three options for controlling the onboard navigation system, stereo, phone, and air conditioning. In a demo, Mitsubishi showed how the system presents three likely choices selected by a predictive agent that anticipates what the driver wants to do based on user history as well as current conditions such as the vehicle's location or internal and external temperature. For instance, if the driver selects a local golf club as the destination in a navigation system, the HMI might come up with prompt offering to dial the number of the driver's regular golf partner. Or if the car suddenly meets a traffic jam, the HMI might suggest getting a traffic report or calling home to tell someone about the delay. The driver can make selections by voice or by pushing buttons on the prototype's steering wheel. The voice-recognition engine uses user-registered terms as well as destination data stored in the cloud. The buttons can also access other choices not presented by the predictive agent. "Drivers nowadays want to control the navigation system, audio system, phone and air conditioner while driving," Mitsubishi Electric spokesman Katsunobu Muroi said. "Operation of this equipment disturbs the driver's concentration. We want to reduce the number of driver operations for safe driving and to provide an easy-to-use interface." Mitsubishi said the new user interface can cut the time it takes to operate onboard devices to less than 15 seconds and only two operations such as the push of a button. The 17.2-inch HUD, meanwhile, appears to be farther away from the driver than most displays in order to minimize eye refocusing when shifting gaze from the road to the menu choices. Mitsubishi said it aims to offer the HMI to carmakers with an eye to commercializing it from April 2018, adding it has applied for dozens of patents on the technology in Japan and overseas.